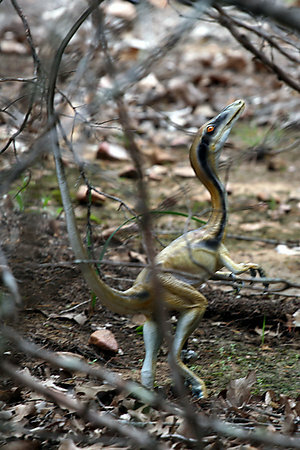 Compsognathus is often described as “the size of a chicken”. This description is based on an almost complete skeletal specimen discovered in Germany in the 1850s. Over 100 years later, a second skeleton fossil was found in France in the 1970s, and showed its size slightly larger, more adequately compared to “the size of a turkey”. Some scientists explain the size difference by the belief that the first skeleton found in Germany might have been that of a juvenile. Either way, Compsognathus is surely one of the smallest carnivores of the Jurassic Period. It is also one of the few dinosaurs for which the diet is known with certainty: the remains of small, agile lizards are preserved in the stomach of each of those two Compsognathus’ specimens. Compsognathus is the closest supposed relative of the early bird Archaeopteryx.